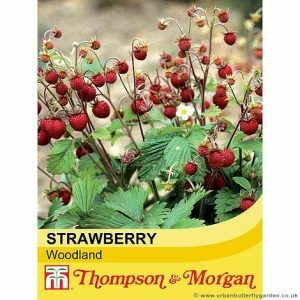 The Wild or Woodland Strawberry is similar, in appearance to the well known garden strawberry although still edible it is overall much smaller. 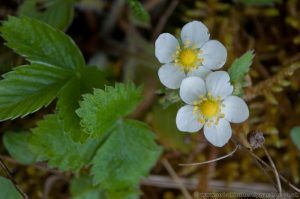 In the UK they can often be found growing in many dry grassy places, from Woodland rides, Meadows and Gardens to Road side verges, often sending out long runners and colonising any available ground. The leaves of the strawberry plant are made up of three oval leaflets, the small flowers have 5 white petals and a rich yellow centre and appear April to July. 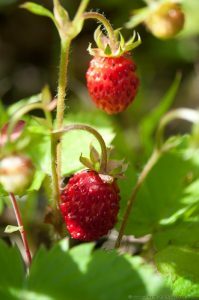 Wild strawberry fruit or berries, may be found from June through to October, although small size they are stronger tasting and are often used commercially in jams and medicines. Habitat: Often found on well drained – Meadows, Road side verges, woodland Clearings, Gardens and tracks. When does it flower? April to July. Fruiting: June through to October. Yellow Rattle (Rhinanthus minor) in Wild Flower Meadows.